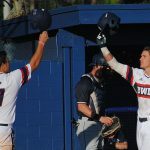 BOCA RATON – Pitchers Jake Miednik and Kyle Marman, FAU’s Friday and Saturday starters respectively, will remain teammates for at least one more year. The Cleveland Indians selected Marman in round No. 13 and Miednik seven rounds later on Wednesday, the final day of the 2018 MLB Draft. “I shot him a text that said, Hey man, they can’t separate us,” Marman said. Upon hearing he would be an Indian, Miednik immediately made the connection to Marman. Miednik, a senior, has exhausted his eligibility and will sign with Cleveland in the coming days. Marman’s situation is a bit more complex. A junior, Marman underwent elbow surgery in March and missed the remainder of the season. 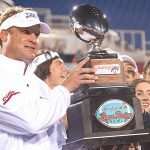 He has the option of returning to FAU in hopes of improving his draft status next year or signing with Cleveland in the coming days. Boasting a fastball that hits 92, along with a curve ball, slider and change-up, Marman dazzled early in the season, posting a 4-0 record with a 1.45 ERA in five starts. He underwent surgery to reattach his ulnar collateral ligament to the bone. Marman will continue to rehab his elbow with Cleveland, which will keep him from pitching this summer for an Indians’ minor league affiliate. Miednik learned he’d be joining Marman when his name popped up on MLB’s draft tracker. Minutes earlier Miednik received a call from his draft adviser telling him that his time was about to come. Shortly after seeing his name on the tracker Miednik received a call from Cleveland’s area scout officially informing the lefty he’d been drafted. Miednik waited longer than he’d hoped for that call. He expected to be drafted last season, but that didn’t happen. As a senior the lefty posted an 8-1 record with a 3.31 ERA as a senior. He struck out 91 batters in 81 2/3 innings while walking only 21. Marman and Miednik were two of five FAU players selected on the final day of the MLB draft. Center fielder Cody Wilson was the first of the Owls chosen on Wednesday, going to Washington two picks before Marman’s selection. Wilson hit .285 and led FAU with 14 homers as the Owls center fielder this season. On Tuesday Wilson, 24, expressed his interest in turning pro. Like Miendik, Miranda expected to be drafted last year as a junior, but the call never came. In a bit of a surprise, Toronto selected little-used reliever Matt Harris in round No. 33. Harris only appeared in 16 games for FAU this season, starting once. The right-hander who transferred to FAU from Elon as a graduate student posted a 1-0 record with a 5.18 ERA. Overall, MLB teams selected six FAU players during the three-day draft. On Monday Tampa Bay nabbed shortstop Tyler Frank in the second round with overall pick No. 56. Conference USA’s Defensive Player of the Year, Frank hit .300 with 13 homers, 35 runs batted in and a team-high 70 runs scored. The draft didn’t wreak much havoc on FAU’s incoming signing class. San Francisco selected Indian River Community College closer Travis Perry in round No. 28. It is unclear whether Perry intends to sign with the Giants or play for FAU.